Whether it’s 32 degrees or 82 degrees, weather in Ashland, Ohio is variable and sometimes unpredictable. Fluctuating temperatures can dramatically increase your utility bills, especially when you’re running the air conditioner and heat in the same week. However, window replacement, home siding, entry door installation, and roofing from UWD can help keep those bills in check while improving the overall comfort level of your home. This is achieved through offering quality products and professional installation, leading to some of the most energy efficient home improvement products available in Ashland. Does your home never stay the right temperature, regardless of your endless battle with the thermostat? The underlying problem may be within your windows. A house with old, inefficient window products can lose a significant amount of energy. This lost energy translates to lost dollars, and often a home that is always too hot or too cold. What’s the solution to finally ending the war with indoor temperature control? The answer is UniShield® replacement windows. UniShield® is the exclusive window product from UWD, which offers top-of-the-line energy efficient solutions. If your goal is to keep your home warm in the winter and cool in the summer, UniShield® is the window for you. The UniShield® series is available in four tiers of energy-saving glass packages. This system makes the windows affordable for nearly any budget, allowing every Ashland homeowner to experience the power of new window installation. The first tier, UniShield® Classic, features dual pane glass that makes your home feel cozy throughout the year. The highest package, UniShield® supreme, is essentially the Cadillac of home replacement windows that maximize energy savings. This window features triple pane glass for additional energy savings and sound reduction, along with krypton gas and a double application of low-e for ultimate comfort levels. UniShield® may be efficient, but it’s aesthetically flexible as well. Whether you’re living in an old Victorian or a modern colonial, UWD can craft your new window product to your exact specifications. Vinyl window material is the most popular option in America due to its durability and low cost. UWD uses high grade vinyl to ensure resistance to warping, peeling, and fading from sun exposure. Decorative glass options and grids are also available, along with a selection of exterior frame colors to complement your curb appeal. 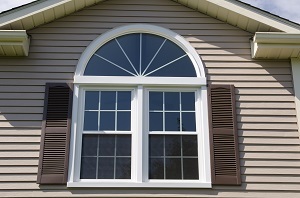 You’re selling yourself short if you choose window installation with subpar products. Consider UWD for an affordable, quality upgrade. If you’re looking for a better door product, UWD has superior doors and weatherproof materials for protection and security. An entry door is an important exterior addition to any home, as it withstands the weather here in Ashland while keeping intruders at bay. 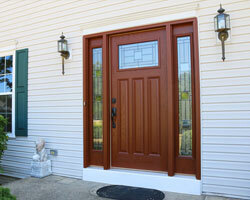 When you want more from entry doors, consider UWD as your go-to source for quality front door installation. Both fiberglass and steel doors are available from UWD. These two materials are a popular choice with homeowners, and with good reason. These materials withstand the elements while adding class and elegance to the home. Fiberglass is designed to add the warmth of wood without breaking the bank. You can also choose from our inventory of exterior paint colors, or order your door primed and apply your own coat of paint. Furthermore, fiberglass is also an energy efficient door option with a polyurethane foam core. Steel doors offer a tremendous return on investment—around 90%. They are also quite durable and will keep your home comfortable with professional installation and an internal polyurethane foam core. When your goal is saving energy and enhancing security, there is simply no better selection than doors from UWD. Whether you choose fiberglass or steel, the door is professionally installed to create an airtight seal. This reduces drafts and keeps your home at a consistent and comfortable temperature throughout the year. Each door is protected under UWD’s True Lifetime warranty, which covers pieces, parts, and more. "This was my 3rd window project. 14 new windows installed with 6 more to go..."
No matter the season or weather, UniShield® vinyl siding is an exceptional exterior that’s built to last. Every panel envelopes your home in heavy-gauge plastic with thickness of up to .46”. Material quality and panel thickness is one of the most important components for long-lasting siding, and you can enjoy your new exterior for up to 20 years—and sometimes longer. UniShield® exterior improves the look of your home while simultaneously improving its structural integrity. Professional installation reinforces the panels and ensures that moisture doesn’t reach your exterior. Otherwise, your home is at risk for costly damage such as mild and mildew growth. UWD is proud to offer numerous color options for your exterior. Vinyl cedar shakes and scallops are also available for an extra boost in curb appeal. Your new siding is professionally installed and covered under the True Lifetime warranty, including 20-year color guarantee. UWD is a partner of Owens Corning, one of the most prestigious names in roofing. 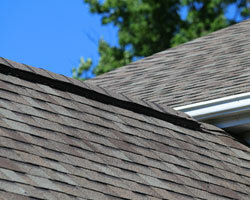 This allows us to offer the highest-quality roofing in Ashland with exceptional, durable shingles. These shingles are heavy, durable, and installed with SureNail technology that withstand winds up to 130 MPH. SureNail features breakthrough design with adhesive power that simply can’t be beat. Furthermore, ProEdge Hip & Ridge helps balance ventilation in your attic space. WeatherLock G contributes the important water barrier system, which is self-sealing and protects against ice and moisture. Owens Corning shingles provide stunning contrast and adds dimension to any roof. You’ll find a variety of colors ranging from Amber to aged cedar, making your home stand out from the rest. Roofing from UWD is professionally installed and protected under the 10-year workmanship limited warranty and the Preferred Protection Roofing System Limited Warranty. When you need exterior that truly combats against the elements, choose the products from UWD.